A retainer fee is money paid in advance, usually to an attorney, for services that will be rendered. A retainer might be paid monthly based on an estimate of the amount of work to be done for the client in that month, but it often covers anticipated work on the entire case from start to finish. You might pay your lawyer $5,000 to handle a custody matter for you, or your accountant $500 to provide services for your business. In either case, every phone call, every letter written, and every 10 minutes spent on your case is billed to the retainer amount you've placed on deposit with the firm. You would not get a refund or a credit ​toward the next month if you don't use the full amount of the retainer in most cases, but this isn't always the case. 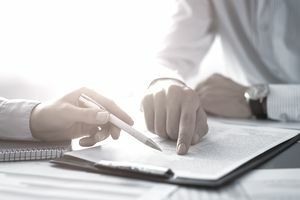 It's important to read the fine print of any retainer agreement you sign so you understand how these "overpayments" will be handled. What Is Included in a Retainer Agreement? The amount of the initial retainer fee, which might appear as "earned when paid." In other words, it's non-refundable. Billing rates that are charged against the retainer. These rates are typically for the attorneys at the firm and their staff members as well, because they'll also be working on your case. Individual rates are determined by their respective educations, years of experience, and specialized expertise. For example, an experienced partner would charge much more than a new paralegal. Additional costs which might be charged in addition to the retainer fee, such as court costs, costs incurred during the discovery process such as for depositions, travel expenses, postage, copying, and long distance phone charges. Billing frequency and terms. Bills are usually sent out monthly, showing the costs for the previous month and the amount of retainer fee remaining. Additional costs, or additional retainer amounts, are often due "upon receipt." What happens if you don't pay? Recourse might be a service fee or interest on the overdue balance, or the imposition of a lien on your documents and property in possession of the attorney. In other words, you won't get your stuff back until you pay the attorney's bill in full. Attorneys are legally and ethically obligated to deposit your retainer fee in special trust accounts, not in their business accounts. An attorney will then transfer funds from that account into her business account periodically as the case progresses—usually on a monthly basis. Transfers occur after she earns the money by performing services on your behalf. A professional is basically working off the retainer, and it's up to the client to make sure that transfers made from the amount of the retainer fee are supported by time spent on the case. You should receive an update letter every month as you work with your attorney or other professional. The letter should include an accounting statement with details of the work that was done on your behalf and billed against the retainer. The accounting should include time billed for each item of work done or contact made, with a total for the month. If you don't get a letter or an accounting statement every month, ask for one. A good attorney will alert you when your retainer is on the verge of being depleted. She should notify you that either that a new retainer fee must be deposited, or get your permission to go over the retainer and bill you monthly for the overage. Some attorneys put a clause in their retainer agreements stating that you agree to keep paying even after the initial retainer fee has run out. A retainer arrangement benefits both the client and the attorney. The attorney has the assurance of being paid monthly or at least on a regular basis. This is particularly helpful if a client is slow in paying. The retainer arrangement is also beneficial for the client because it provides an anticipatory budget for legal fees. Depending on the nature of your case, however, it's not uncommon for a legal matter to "blow up," requiring much more time and effort to resolve. What if You Receive a Summons or a Subpoena? What is a Plaintiff? What Does a Plaintiff in a Lawsuit Do?